Oromo and Ethiopian Oromo South students are in grief and sadness over the government corruption that is going on back home. Some have migrated here only a few years ago and some have been born here, but the impact breaks the heart either way. It’s a devastating time in the history of Ethiopia, as the long time hidden oppression has been revealed to the world. It was November of 2015, and the Oromo people of Ethiopia said enough and started to protest. Oromo people are the biggest ethnic group in Ethiopia and they have been the oppressed region over land, politics and even language since the start of the current government. According to BBC News, as of August 2016, over 500 people have been killed by the government and more than 10,000 have been arrested. Ethiopia is a country located in the horn of Africa with 9 different regional states and with over 80 different ethnic groups. The main participants in this protest are in the Tigray and Oromia region. Tigray is located in the northern part of Ethiopia and is the 5th most populated region with over 5,000,000 people. This region has a government party named Tigray Peoples Liberation Front. Oromia is located in the west and central part of Ethiopia. The capital city of Ethiopia which is called Addis Ababa is located in the heart of Oromia. The land of the city is owned and controlled by the government of Ethiopia. Although it’s the biggest ethnic group in the country, the people don’t have much say in the government actions. As an Oromo student in America that lived in Ethiopia for more than half of my life, I have not been able to voice my opinions about the government until I came here. Part of the problem was that I never knew that the government was corrupt until I was 12 years old. In school, my classmates and I were always taught about the constitution, what rights we have and how we were free to practice them. The things I learned in school and the things I saw in my community didn’t correspond. I used to go to a k-8 school and the high school students were protesting and the security forces were beating and nearly killing the students. I was taught that people can protest about anything and were free to address their worries about the government, but when I asked why isn’t anybody protesting or voicing their worries the response I got from my teacher was “because the people don’t see any wrong in the system, they are happy,” and I believed it. I was taught to believe that the system was perfect but there was no way to find out if it’s really true. Every time there would be an anti-government event going on, the news would report that the civilians were the one who did wrong. The government controls anything and everything that is released to the public. Among other things, the government controlled any opposing parties too. Oromia also has a government party named Oromo Liberation Front. This party was banned in 1992 by the government, to prevent and discourage the voices of the Oromo people in the parliament. The government then created a different party called the Oromo People’s Democratic Organization. Although this party was supposed to represent the Oromo people, events show that they have not been successful. The anti-government demonstrations started when the government announced that the so-called “Master Plan”. This “Master Plan” concept was to expand the capital city, without the consideration of the Oromo people’s lands. This plan could have displaced many people and would have taken the farm lands that are essential to the people’s survival. According to The Guardian, in January 2016, two months after the protest, the government called the plan off after talking with representatives and stated that they have “huge respect” for the protesters who were opposed to the plan. “They have a constitutional right to protest but the government started shooting at these people,” said Sophomore Ayantu Hundessa. Hundessa is an Oromo student at South. She was born and raised in Ethiopia and only came to America in middle school. Hundessa has been interested in the problems back home and has tried acting on it by creating a humanities project focused on this topic to inform her peers and teachers and to bring attention to this injustice. The violence in Ethiopia has had a strong impact on Hundessa and her family. Although the “Master Plan” was called off, there were bigger problems that were the root cause of the protests. There was still questions about the actions the government took while the protests against the plan. Before they called it off they had already killed and arrested over 140 people. They didn’t address that in the statement they made when canceling the plan. After a while, the second ethnic group, the Amhara joined the demonstration. The bigger problem in the country of Ethiopia is that the same government party called Ethiopian People’s Revolutionary Democratic Front has been in power for over 20 years. This particular party is the second edition of the Tigrayan People’s Liberation Front party, so that makes the majority of the government officials, the Tigray people. With the Oromo people making up 34.4% of the population and the Amhara people making up 27%, the Tigray people are still in power of the whole country despite only making up 6% of the population. Although Ethiopia is recognized as a country which has democracy, the actions of the government says otherwise. Every time a civilian has tried to practice their human rights that are also written in the country’s constitution, they face unacceptable consequences. According to a Humans Rights Watch report, since 1992 the security forces have arrested 10,000 of Oromo people accusing them of supporting or being a member of the Oromo Liberation Front. These prisoners are now known as terrorists, since the former Prime Minister passed the draconian anti-terrorism law in 2011. Most of the world has only been hearing about this issues since the summer of this year during the summer Olympics in Rio. After crossing the finish line in 2nd place, an Ethiopian marathon runner Feyisa Lilesa held his hands in a crossed sign. 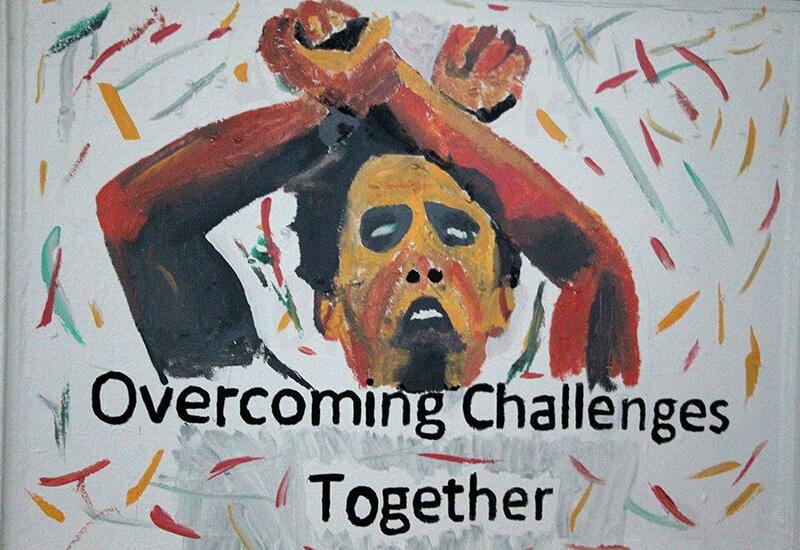 Crossed hand signs have been the symbol that is used for the Oromo protest. Lilesa is considered a hero to speak about this topic while knowing what kind danger he’s in. Mekonnen is a first generation immigrant, meaning her parents have come to America before she was born here. Mekonnen identifies as Amhara, and Ethiopian. She has visited Ethiopia several times. Although the reasons to for the government to act this way toward its own people is complicated, some experts think that the government will do anything to not lose the power they once won over. The opinions of the South students deliver much deeper reasons. In my opinion, the reason to why the government keeps acting this way is because they have been bloodthirsty for power before and still are. They think they are somehow superior to the people of other tribes than Tigray. They think if they won once, they deserve to be entitled to win each time. They have set their goal once will never stop until they reach it. Whether they have to destroy every single body in front of them or even destroy a whole group. The killings in Ethiopia have been just an everyday occurrence to the government. “It’s become dirtier and I feel like they’ve become desensitized to the killings and serious damage they’ve done to their people,” said Mekonnen. Recently, according to Al Jazeera, nearly 100 people were killed in the Oromia and Amhara region in a recent three-day protest by security forces and over 50 people killed at a religious celebration in Oromia on October 2. Over 20 prisons, were dead because of a fire accident as reported by the government. Critics say it’s just a cover up for the actual group responsible, security forces. The biggest platform for the movement in Ethiopia has been social media, especially Facebook. Many participants in the protest who are currently living in and outside Ethiopia have used the #oromoprotest to spread awareness. As of August,2016 another ethnic group has joined the protest and has been known with the #amharaprotest. Ethiopia declared a state of emergency on October 9, 2016. Since then, internet access has been banned, people cannot watch certain TV channels, especially the ones that are about Ethiopia but are created in another country. The government has also has banned most forms of protest, and people are not allowed to show a political gesture as Lelisa did at the Olympic finish line, along many other restrictions. Having these restrictions has made it harder now to shine attention on the genocide in Ethiopia.This historical event in Ethiopia has just begun and there still is much to do before it’s resolved. This topic at South has not been discussed nor brought up in anyway. Having nobody noticing what is going on back home, what our families back home are dealing with is sad. Hopefully after this article, the student body and the staff can take time to recognize that their classmates are grieving inside while showing a normal face in class. “Our social media outlets are a big tool, when I talk about it out loud, I see that not really that many people care,” said Mekonnen.